The site consists of genuine Bedouin tents with brightly coloured rugs and mattresses, wood and stone built function halls (Divans), desert style guest rooms and suitably placed seating areas in shady spots. 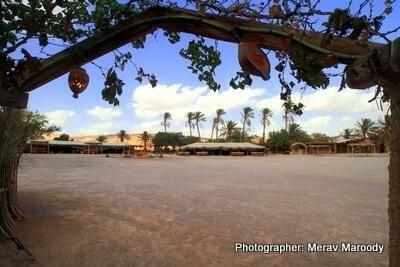 While staying in the village (Kfar) opportunities to have fun are ample and diverse. Guests will experience warm Bedouin hospitality as well as the chance to learn about Bedouin culture and life as well as a host of differing receptions, a variety of meals and after feast activities, assorted trips and accommodation choice of tents or cabins. 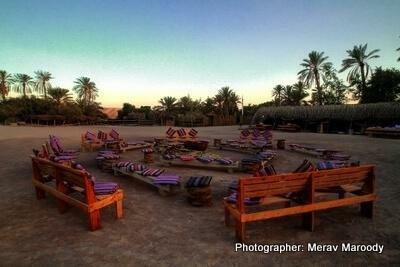 One of the most popular activities at the village is the Sheik style Dining. Guests are welcomed by the Bedouin hosts and invited to relax and be seated either at low tables with seating on soft sofas or high wooden chairs and tables. All the tables have servings of salads served in small clay bowls. The colourful salads thick green tahini, spiced Arabic salad, spicy matbuha, homemade pickles and fried eggplant with mint, cabbage and ground pepper as well as jugs of mint lemonade and fresh cold water. 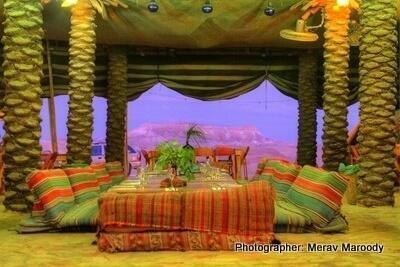 The Bedouin hosts then serve different varieties of homemade pita. After that the feast continues to arrive, large dishes with Bedouin rice and vegetables in the middle with sweet corn around it followed by trays laden abundantly according to Bedouin hospitality, with skewers of chicken and homemade kebabs. The feast ends with sweet pastries (baklava), Turkish coffee, spiced Bedouin tea and fruits of the season. Accommodation at Kfar Hanokdim is varied with either Bedouin tents resistant to all weather conditions and heated in winter or fully furnished air conditioned cabins with en-suite toilets and hot showers and including tea and coffee making facilities. Typical Israeli breakfasts are served. 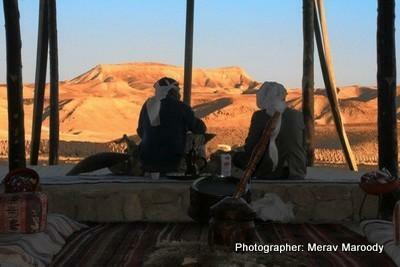 To add to your Bedouin desert experience there are Camel treks through the Bedouin settlements.